Is there anything better than a hot cup of coffee in the morning? I’ve always loved coffee, but I’ve often wondered: is coffee making my Small Intestine Bacterial Overgrowth (SIBO) or Irritable Bowel Syndrome (IBS) symptoms worse? Because this is one of my #1 questions, I’ve made it a habit to ask as many expert doctors and practitioners as possible what their opinion on coffee is. Today, I’ve rounded up a bunch of opinions on coffee and I’m sharing them with you. “On my handout it says “weak coffee is okay,” 1 cup a day. But [do I think it’s good beyond that], no. If people are drinking coffee and they’re getting 10 ounces, 12 ounces, that is gonna work against the gut. It’s acidic. It’s irritating. And if they have diarrhea SIBO – coffee, caffeine stimulates peristalsis action. It drains the adrenals. It interferes with good sleep. “Oh, but, doc, I just have one cup before 9:00 in the morning!” Yeah, well, there’s no law that says it’s detoxed [before the end of the day]. Coffee tends to wake you up at 3:00 a.m. [That is] the liver clog, the liver time on your Chinese clock. This is the time people wake up because they’re on a drug that their liver has to detox: caffeine. And then you wake up kinda wide awake, right? “Coffee is stimulating. A lot of people are dealing with adrenal fatigue and they drink coffee to keep them up. Yes, there’s the “Bulletproof” that’s supposed to be fungal free but most coffee that you go and get at Starbucks – there’s a lot of fungus on those beans, those funguses, the aflatoxins and other things. Not good for you. It thins the digestive lining. It actually thins out; the caffeine thins out the digestive lining. “I don’t like to generalize about that because I think a healthy body can enjoy coffee. I think coffee is a problem for many sick people. Coffee is not a healing agent for sick people. Why is that? Many reasons. The methylxanthine, the acids in coffee can be very difficult for a bowel. For people with SIBO, coffee is often used almost as a laxative. It stimulates that. Now that could be good to move the bacteria out if it’s constipation predominant or there’s an interruption motility to the point where the bacteria are kind of stuck in the small intestine. The coffee could be good. “Coffee is a tricky one. If you had asked me ten years ago I would have said it was bad, bad, bad, but now they’ve done a lot of studies on coffee. Coffee that’s organic and free trade, in moderate amounts, actually seems to be a good antioxidant and anti-inflammatory. “I think [coffee] is person specific. I think all the research out there is telling us that coffee in moderation, like alcohol, can be healthy. There’s a lot of rich antioxidants in coffee, amongst other things. For those reasons, I say, if you can tolerate it great. I would say most of my SIBO patients are adrenally fatigued and coffee is that thing that keeps their adrenals boosted. They’re just trying to get through. Our ultimate goal would be to get at what’s underneath that. Help them so that they can get off coffee, because more often than not it’s a false energy and can ultimately burn you out more. Burn those adrenals out more. “Coffee generally is okay. There’s a few caveats to that. And one of them is I would want that person to have organic coffee and there are some issues about mycotoxins. Mycotoxins are toxins that are released by fungi that can remain in certain foods and one of those mycotoxins is an aflatoxin in peanuts and that’s one reason we avoid peanuts besides the fact that it’s a very inflammatory substance. But with coffee, you know, I’m from Seattle. We tend to line up when we see a green awning, you know. I drink a cup of coffee a day. I don’t think generally there is a problem. The caveats would be the mycotoxin if you’re sensitive to fungi. The other thing is if you are a very nervous person and some people that have a very poor what’s called caffeine clearance, that’s a measurement of how well your phase one detoxification works and that’s the first part of your detoxification system. If that’s a bit gummed up by all the other things that are happening, then if you’re somebody who drinks a cup of coffee in the morning and you can’t sleep at night that’s not a good thing for you. Or if you’re somebody who works their jobs and is flogging a tired horse that’s also not such a great thing to do. Will I take it away because people are like take anything away but don’t take my coffee away. “Coffee is a tough one because people are protective of their coffee. What I have found for a fair amount of my patients is that they’re reacting to coffee as if it were gluten. I’m not talking about the caffeine in the coffee that’s making them ramped up. I’m talking about the proteins in the coffee bean. I’ve said it before… even on “simple” things, the experts rarely all agree! I believe the answer lies in getting as much information from the experts as we can. Then, we can lean into our own innate wisdom to find what works for us and what doesn’t. I created the SIBO SOS™ Speaker Series to help bring you ALL the latest information on SIBO – right to your home. For the rest of 2019, we have 10 expert Speaker Series Masterclass and Q&As scheduled. For a super limited time, you can buy the 2019 Speaker Series and get access to all TEN Masterclasses & Q&As for one very low price. Just $19.80 per Masterclass! Get the Speaker Series HERE. P.S. Is coffee a friend or foe to you? I’d love to hear YOUR experience. Please leave us a comment! P.P.S. Wondering if this applies to coffee enemas too? The short answer is no – coffee enemas are totally different than drinking coffee. I’m working on a new blog post all about coffee enemas, so if that topic interests you, keep an eye out for a new blog post very soon! Fabulous blog post!!! I’ve been wondering how detrimental my 1 cup of coffee is each morning. I do notice a huge difference between brands, Bulletproof & Purity seem to be the purest. Love hearing the opinions of so many practitioners on the same topic, brilliant!!! Thank You!!!! Thank you for this blog post Shivan. I am excited to see what you will bring. I thought your coffee blog was profound in that you gave us different angles to look at the coffee issue. I feel that most of the experts put the ball in our court. And that is predominately what I had to learn about this SIBO experience—it is so individual. But also now we know through Dr. Morstein, if it makes you feel bad, listen to your body. Ok, see you next time Shivan. I’m eagerly looking forward. Thanks for this. Excited to see your post about coffee enemas as I’ve been hearing more and more about them! In response to Dr Messinger, respectfully, that information on coffee is incorrect according the study done by Dr Vodjani of Cryex labs. were responsible for the other 62% of immune reactivity. Thanks for sharing this information Shan! REally appreciate your posting this information, especially the copy of the write up. Thank you Shan, I was just about to reply about that study. This is a perfect example on how one study “ends up” meaning something else because people too often just don´t go to the reference directly ,they just rely on blogs which sometimes don´t Always get it right.. I have never liked coffee, and prior to SIBO, I jumped out of bed with tons of energy, so I never needed a “wake me up” beverage like so many of my friends did. I usually drank some nice tea. Now, being a SIBO patient, I don’t drink anything with my breakfast except water to swallow my supplements. Then more water during the day to stay hydrated. Shivan, can you ask Dr. Pimentel what he thinks about coffee? I have methane SIBO and apparently archaea consume acid and coffee is acidic. I haven’t had a cup in 7 years and I still miss it! Thanks for asking Diane! I will see if I can find anything we have from Dr. Pimentel about coffee. 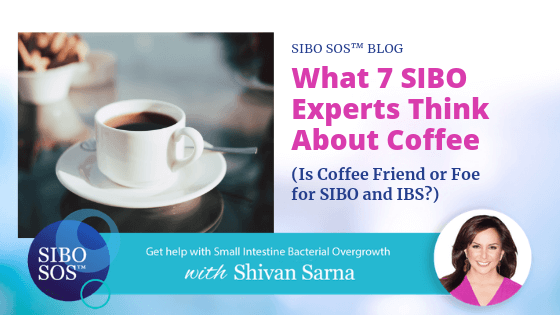 It would be great if Shivan could do an update post/email with the answer to this question — I would have loved to have heard Dr. Pimentel’s thoughts in this round-up, and not just on an anecdotal basis but the actual facts about whether coffee feeds the SIBO bugs! I’m one of those people who loves coffee and won’t give it up for anything. However, I have changed out my cream and sugar for coconut oil and butter, I stopped drinking flavored coffee due to the additives and I stopped drinking dark coffee. I can’t do weak coffee though! This article was very informative and gave me more to think about…like shifting to organic, fair trade coffee. Thank you for this! Hi! I seem to be sensitive to coffee. I do believe it’s the protein in the coffee been beacasue I can not tolerate protein well. A protein shake or protein bar makes me very ill. I love coffee but have been having a hard time with digesting it. One cup makes me swell although I truly enjoy the taste. What is the bulletproof coffee? I seem to be sensitive to a lot of things with age. No fun! Love your blogs, Shivan, Thank you, great articles, really enlightening. been without coffee some weeks, and now after trying again woke up 3 o’clock. Seem to be forced to quit it now for a quite while. or forever, we’ll see. Adrenal exhaustion etc, CFS, Hope I find some remedies, before too late. I do love to have a weak cup of coffee. That said, I have Bullet Proof because I also have had problems with micotoxins from working at a mold infested workplace so I only have Bullet Proof because they check for mold. Love a cup of coffee with 1/2 & 1/2 – it’s even better than a glass of wine! However, must stop consuming both coffee and wine. Any suggestions for coffee substitutes? Have tried several flavors of Chicory Herbal Coffee – but chicory leaves a lot to be desired. Also looking for something more tasty than coconut cream/almond milk. Any suggestions? Do drink herbal teas – but they are NOT coffee! Hey Karen – I know what you mean! I don’t think there is anything on earth that really replaces the taste of coffee. I found that while I do love the taste of coffee, what was most sacred to me was the ritual of drinking a cup of coffee in the morning – it was a treat that made me excited to get up and get going. Once I got past the caffeine withdrawals, I was able to replicate the “treat” feeling with herbal tea, hot water with lemon, or even a breakfast smoothie I was excited about.